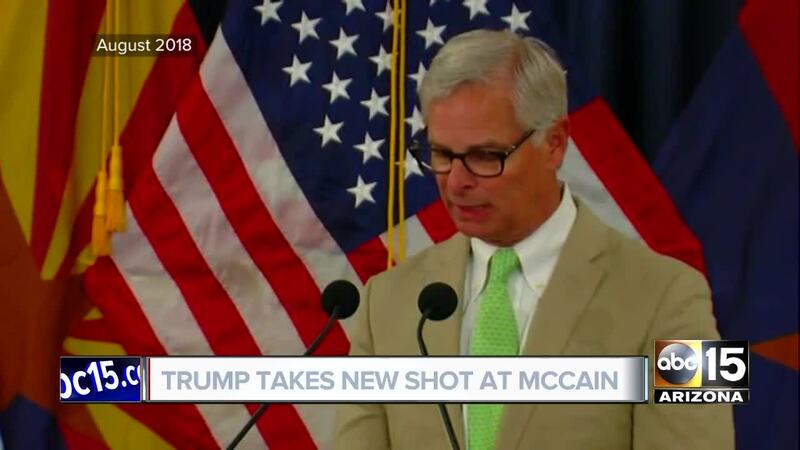 PHOENIX — Video from the days after the passing of Senator John McCain disproves President Trump's claim at a rally yesterday that the McCain family never thanked him for his administration's role in remembering the late Arizona senator. 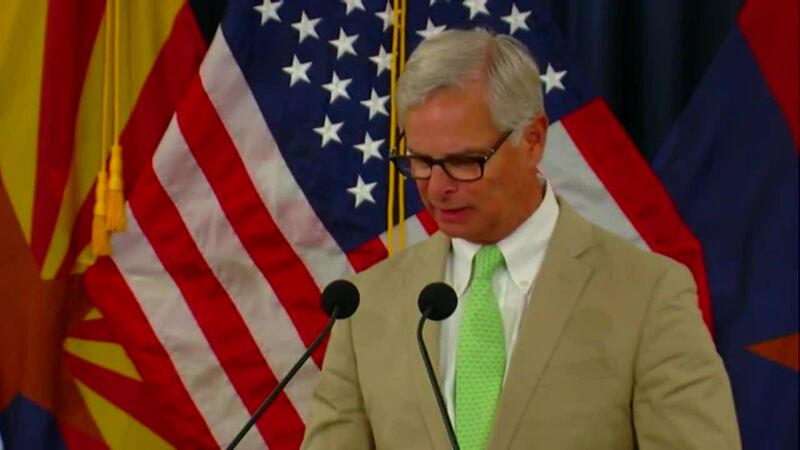 Former McCain presidential campaign adviser Rick Davis held a news conference at the Arizona Capitol on August 27, 2018--two days after McCain's passing. He started by thanking a long list of state and national figures for their support and assistance in putting together the logistics of McCain's services in Phoenix and Washington, D.C.
"The family has asked that I first thank some people who have been very instrumental in helping to pull together with such short notice this week's funeral plans," Davis said. Watch all of the people and organizations Davis thanks in the player above. Davis first thanked Governor Doug Ducey and his staff for the arrangements to have McCain lie in state at the capitol and his funeral at North Phoenix Baptist Church. Davis then thanked then-Senate Majority Leader Mitch McConnell and then-Speaker of the House Paul Ryan for allowing McCain to lie in state at the U.S. Capitol, an honor bestowed upon only 29 other figures in history to that point. After the leaders in the House and Senate, Davis thanked other parts of the federal government, including President Trump and the White House. "The combined efforts of the Trump administration, the White House, [Defense] Secretary Mattis, the Department of Defense and the military district of Washington are very experienced in these issues related to the logistics of a funeral of this magnitude and we really thank them for coming together very quickly in pulling together all of the federal resources that we have," Davis said. Trump's claim continues an ongoing feud he had with Senator McCain dating back to the campaign trail but his attacks have come nearly every day this week, starting with tweets over the weekend about McCain's role in delivering the Steele Dossier to the FBI and a dramatic, thumbs-down vote against an effort to repeal the Affordable Care Act. He continued on Tuesday, saying he "never was, never will be" a McCain fan. The comments have not gone unanswered by the McCain family, with Meghan McCain saying Trump would never reach the level of adoration of her father. "No one will ever love you the way they loved my father," she said. "I wish I had been given more Saturday’s with him. Maybe spend yours with your family instead of on twitter obsessing over mine?" Sen. McCain's youngest daughter, Bridget, who typically avoids the public eye, was also moved to criticize the president's recent comments, calling him a child. "Everyone doesn't have to agree with my dad or like him, but I do ask you to be decent and respectful," Bridget McCain said. "Even if you were invited to my dad's funeral, you would have only wanted to be there for the credit and not for any condolences. Unfortunately, you could not be counted on to be courteous, as you are a child in the most important role the world knows."